Free Shipping Included! 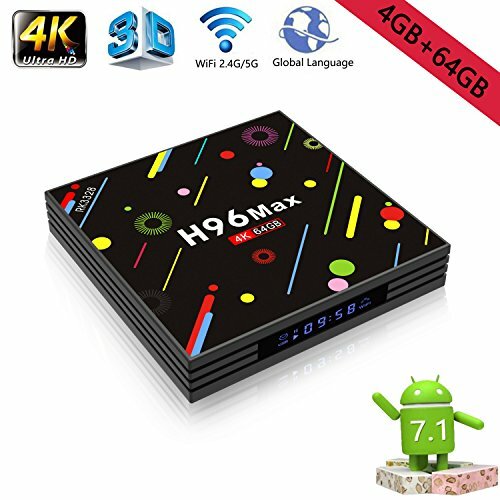 Android 7.1 TV Box 4G+64GB H96 Max 4K Display Screen RK3328 UHD Quad-Core WiFi Ultra HD H.265 Bluetooth by Drizzle at Andy Pemberton. MPN: Drizzle. Hurry! Limited time offer. Offer valid only while supplies last. -Smart TV box equipped advanced visualization clarity display screen. -4K UHD quality provide user enjoy the most high-definition real picture. -Smart TV box equipped advanced visualization clarity display screen. -4K UHD quality provide user enjoy the most high-definition real picture. -Quad-Core processor no freezing and buffering make quick connection. -Free Internet searching, thousands of android applications, games, etc. Visualization display screen show the exact time clearly, pause and play. Whether connect WiFi or not,USB connected.Unique feature make the TV Box more practical convenient. Network Function:Neflix, Vudu, Skype, Picasa, Flicker, Online Movies, etc. Option:Support 2.4GHz wireless mouse+keyboard via 2.4GHz USB dongle. OSD type language:English/French/German/Spanish/Italian/etc multilateral languages. [Android 7.1] Equipped advanced visualization clarity display screen with the newest OS generation of smart TV box RK3328 Quad-Core 64bit Cortex-A53, Penta-Core Mali-450 Up to 750Mhz, support 2.4GHz wireless mouse and keyboard with WiFi 2.4G/5G contains Bluetooth. [4G+64GB] Huge storage provides plentiful room to the operation and operation of software. Free download various apps, games. Allow access millions of websites such as YouTube, Google, Facebook, etc. Easy and quick connection and simple operation. [4K Ultra HD] Taste of true-to-life picture and high-dynamic-range technology can provide user enjoy the most high-definition the real picture quality,superior quality built-in sound and unique sound system. [Streaming Media Player] Provides multiple language functions solve the language problem. Possess tens of thousands of channels, over 100000 movies and music,includes a variety of usual TV episodes. [Advanced Features] It's high machine configuration give user ultra-fast running speed and professional image processing ability. Quad-Core processor without freezing and buffering. Ensure that users can get the highest level of experience.